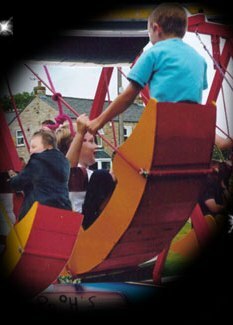 The most popular traditional ride of all to totally enhance any village green must be the OLDE TYME SWING BOATS, this delightful corporate fun fair ride for hire from grandma's era will make your event complete, Carnival Fun Fairs' 4 bay set of swing boats are trailer mounted and painted to the highest standard. Add these to their Deluxe Alice in Wonderland Cup & Saucer Ride - Funtasia House of Fun - Beautiful Traditional Striker & Hook a Duck attractions. They provide deluxe corporate fun fair rides for hire, specialising in corporate events, school fayres, village green fairs, gala days and carnivals. All Corporate Fun Fair rides for hire are fully insured, self contained, immaculately decorated and staffed by Police Checked Personnel.